Yuki sent this to me this morning. We were going up that way so we stopped to check it out. 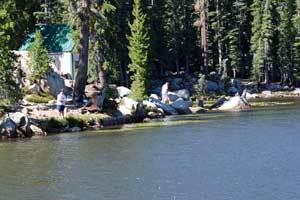 Mosquito Lakes are a pair of picturesque mountain lakes which attract anglers from around the area. As soon as the highway opens - usually in mid-May - fishermen can be seen perched along the shores of the lake. It's a relaxed kind of fishing. Many people bring folding chairs and sit patiently waiting the trout to strike. 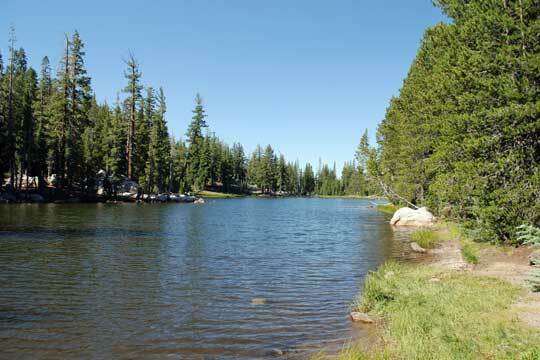 A campground is located next to the lakes and another is found only a short drive away to the east in Pacific Valley. Several hiking trails head out from near the lakes, making great day trips. Many of the visitors to the lakes are not aware of the history of the area. Mountain men, explorers, emigrants, miners, and even Snowshoe Thompson all passed over Pacific Grade Summit during the 19th century. Photographers and artists find plenty of scenes on which to focus their attention, from the cool reflections in the lakes to the broad vistas to the east. Fishing is almost always rewarding at Mosquito Lakes. Everyone fishes from shore, often from the highway side of the lakes. A few more adventurous anglers work their way around to the rocks by the cabins. On your way up to the lake a stop at Ebbetts Pass Sporting Goods in Arnold is a good way to get the latest information on fishing conditions at Mosquito Lakes. While you're there you can pick up all the best lures and baits you will need to land that trophy trout. Looks pretty good, huh. Now let's look at the actual Lake. This lake is actually two lakes connected by a small creek. This one is what I would call Upper Mosquito Lake. Cool cabin only accessible by boat. Note the part above in red. Trophy Trout. That look like a trophy trout to you? . All four we caught were this size. Full of lily pads too. About 11:00 we packed up and headed down to Lake Alpine to give it a shot. When we passed it on the way up, there weren't very many cars or people to be seen. Once again Yuki caught the first one. I must be losing my touch. Two lakes and Yuki caught the first one at both. As a redemption of my fishing skills, I did catch the other three at Mosquito Lake. Lately, Yuki has had this "thing" for Brown Trout so the next trip we're going to the "Secret" Lake and see if we can get him a big one. Looks like a fine place to cast a line Mark, though I prefer more 'solitary' fishing spots being as I'm an anti-social so n so. Mark it's just not about the fish, the histories are sometimes worth the trip. So many places there to fish and all good like the perfect lake to fish. Mosquito is a really pretty little lake. Tell us some more about those trophy trout you were talking about. I don't know from trophy trout. That's what they said.